We’ve been there and done that. I am referring to migrating some/all of the Flash eLearning to HTML5 a few years ago. So you may ask: why again? When Apple decided to not support Flash on its mobile devices (including tablets), it was the beginning of the end of Flash. 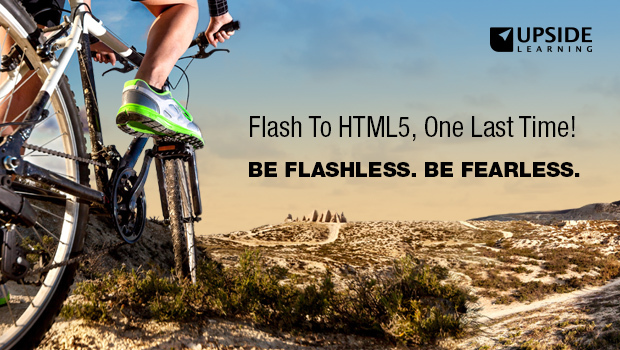 Most of us converted some of our Flash elearning to HTML5 – especially the one that we wanted to be consumed on mobile devices. From there on, we started creating all the new elearning in HTML5 by default even if it was not meant for mobile devices. However, there still existed volumes of legacy Flash-based eLearning which was meant for desktop only. There was no real need to convert those to HTML5 as Flash worked just fine on desktops. But things started looking different in 2017 when Adobe announced about the demise of Flash — in all its forms for all types of devices. The end is predicted to be somewhere in early 2020. This puts all the Flash-based desktop only eLearning out there, at risk. It also means that time is literally running out for all the organizations who haven’t yet migrated to HTML5. Through our discussions with clients and prospects, we are coming across organizations sitting on hundreds (even thousands) of Flash-based courses that need conversion in the next 12 – 18 months! Start by carrying out an inventory of your courses. You may find that only a part of your elearning library is being used by your staff. The rest of the courses are rarely accessed by anyone, indicating they are either outdated or not interesting enough for your learners. Sometimes even poor meta-tagging could be the reason for low uptake, as learners can’t find the appropriate courses in a system that’s loaded with thousands of courses. You may also find that several versions of the same courses exist on the system. A good start is to find out why they exist as separate versions and check if you can reduce the number of versions (ideally to just one) in their HTML avatar. It certainly goes a long way in saving time and money for your organization. Identify budgets and staff for the project. You’ll probably need to choose which courses you wish to migrate to HTML5 if budgets are a constraint. You may have to decide whether you simply wish to convert them for desktops or would like to do a re-think on that front. This would entail a complete review of the instructional strategy but it’s a great opportunity to add value to your elearning while you carry out the conversion from Flash to HTML5. Depending on your comfort level with different authoring tools, you can zero in on one of the many available out there. We help our clients choose the tools best suited to their needs and have collated most of that knowledge in an eBook which you can access here. Just do it, One Last Time!